HIGH PERFORMANCE. CROSS-COUNTRY TOUGH. EXTREME CROSSOVER. 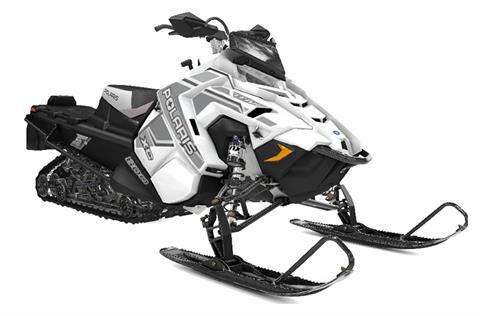 For snowmobile riders looking for a high-performance, cross-country tough sled - plus the "Proven Polaris® Benchmark" of the 800 Cleanfire® H.O. engine. 20 X 155 X 1.8 COBRA TRACK: The proven, versatile Cobra track provides excellent off-trail flotation and aggressive on-trail traction. The strong, stiff lugs won't fold over like some deep snow tracks' softer, more pliant lugs. GRIPPER SKIS: The Gripper Ski delivers impressive flotation in deep snow and smooth, easy handling on-trail. The top surface features serrated edges for boot traction in deep snow. TITAN® ARTICULATED REAR SUSPENSION: The Articulated Rear Suspension provides outstanding ride and handling in all conditions both on- and off-trail. It delivers a smooth ride on trails and can absorb the bumps off-trail. The suspension geometry has been optimized for confident towing, and the rear section of the skid tips up for easy backing up over obstacles. Plus no adjustments are required when switching between solo or 2-up riding or when hitching a large load. FOX® QS3 CLICKER SHOCKS: High-performance, adjustable, and rebuildable FOX® QS3 Clicker shocks offer easy pre-ride adjustability and deliver outstanding performance on- and off-trail. The remote reservoir promotes heat dissipation and ensures consistently outstanding performance in all riding conditions. AXYS® CHASSIS: The AXYS® chassis on the TITAN® positions the rider for Rider Balanced® control in all riding situations - solo, 2-up, with cargo on-board, or towing a load. This platform delivers unmatched ride and handling both on- and off-trail for superior agility and performance in deep snow. TITAN® BRAKE SYSTEM: The industry's only brake system with an integrated idler shaft for brake disc. TITAN® POWDERTRAC® RUNNING BOARDS: The PowderTrac® Running Boards offer an optimized design for maximum snow clean out while maintaining extreme strength. The expanded cut-outs minimize snow and ice build-up. The running board has been designed to provide comfortable ergonomics for both seated and stand-up riding. POWER BOOSTING REGULATOR: The industry-first Power Boosting Regulator delivers maximum electrical power at idle and low RPMs. This ensures electrical power for rider comfort and convenience features, such as accessory heated seats, hand warmers, battery charging and other accessories. TOWING & CARRYING CAPABILITIES: TITAN® offers unmatched cargo carrying and towing capabilities. With a 1,200 lb. towing capacity you can tow more than on any other sled. Plus the sled's integrated mounting system lets riders add or remove cargo easily and quickly. COOLING SYSTEM WITH RADIATOR: This durable, efficient cooling system and radiator ensures consistently reliable engine operation in even the most extreme conditions. The radiator is strategically mounted for ultimate cooling airflow and minimal snow or debris build-up. TITAN® ALPHA TRANSMISSION: The durable, reliable TITAN® transmission provides smooth shifting and drive ranges to suit even the most extreme conditions or situations. Drive ranges include High, Low, Reverse, and Neutral. INTEGRATED LOCK & RIDE® VERSA STORAGE PLATFORM: Innovative, TITAN®-exclusive storage system optimizes the convenience and security of carrying cargo. With an industry-leading carrying capacity of 85 lbs., the design allows for maximum storage with or without the passenger seat. Ideal for hauling fishing gear, tools, firewood, and much more. LOCK & RIDE® VERSA STORAGE CARGO BOX AND RACK: Lock & Ride® Versa Storage Cargo Box and Rack accessory options keep cargo both secure and protected. Engineered for easy quick and easy mounting. Additional storage solutions are available for every type of cargo you need to carry. INTEGRATED 1500 LB. WINCH ACCESSORY: Versatile, mobile pulling power is available everywhere you ride with this powerful integrated winch. It can be operated with the sled engine idling or off and can be mounted on the rear of the sled. Use the winch power to free stuck vehicles, move large items, and tackle tough jobs. 14 GALLON FUEL TANK: This high-capacity fuel tank will provide extended range and will provide those who ride far off-trail with extra peace of mind. Minimizing the need to carry extra fuel frees up even more storage space for other cargo. AXYS® DEEP SNOW MID 13" WINDSHIELD: The AXYS® Deep Snow Mid 13" Windshield is designed to deflect wind, snow, branches, etc. for enhanced rider protection and comfort. POLARIS® INTERACTIVE DIGITAL DISPLAY: This exclusive and industry-leading full color display provides important information and capabilities to the rider such as: sled performance, Bluetooth™, GPS mapping, Clock, and LH Control. This gauge comes as an option on some models and is also available as an accessory. MESSAGECENTER GAUGE: Informative and easy to read, the MessageCenter Gauge keeps a rider aware of sled operating conditions and provides a wealth of additional data. 155x 20 x 1.375 in. Front Track / Rear Track - FOX QS3 Comp. Adj.